Lowdown: A wife and husband stand up to the Bush administration and the lies it used to justify the war in Iraq. Our video libraries are full to the brim with movies telling us to distrust government and authorities, portraying those that stand against them as heroes. However, only a relative few of those are based on true cases. Only a handful portray the human story behind the heroes, the tale of their life before and after they turned heroes. There are not that many that deal with recent affairs, and there are even less dealing with what is probably the biggest government lie of this century thus far: the justification of the war on Iraq through the argument for weapons of mass destruction. Fair Game, however, fits into all of the above criteria. It may not be a film that takes the art of cinema into new realms and it may not feature much we haven’t seen before, but it does tell the recent story of an American couple with kids who stood up to the government on a matter for which the death toll is probably in the millions by now. Not that it helped them, or us, much; the people up there know how to take care of themselves. But it is a start, and it is the moral thing to do. Valerie (Naomi Watts) is, to her friends, a typical working woman and mother of two. However, behind the charade she is a secret CIA agent who manages all sorts of international activities that probably shouldn’t take place in a decent world. Her husband, Joe (Sean Penn), knows about her activities and often covers for her at home. He is also an ex American ambassador to an African country and thus knows Africa well. The two happen to separately face work issues related to Iraq. Joe is sent to Niger in order to investigate rumors of uranium mining for Iraq, while Valerie investigates precision tubes ordered from China by Iraq. In both cases the chase up leads to nothing: no uranium is sold to Iraq from Africa, and those tubes are cases for conventional ordnance. Seems like two open and shut cases, only that someone refuses to let go: it becomes clear people up the food chain, people of the White House, are interested in using these unjustified rumors as justification for war. And that is when Joe decides that he cannot stand by and allow it to happen, thereby publishing an article in the New York Times. What follows is the story of the war fought by America against this couple that stood up for the truth and for the true America. There is not much to say other than express my appreciation for these two, particularly Joe. Like others I got to know over the years they show how standing up for the truth can take severe personal toll, but it is also the only thing a decent person can do. That said, Fair Game thoroughly explores the question of what personal sacrifice is justified when fighting those of authority. After all, was this incident to take place in China, I doubt anyone would complain if the couple chose to keep quiet. As expected, Watts and Penn play their characters immaculately. 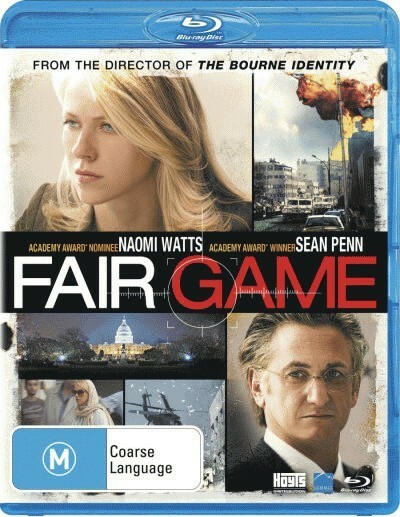 Regarding Fair Game’s authenticity, the fact the movie is out there and hasn’t been sued to death clearly indicates the truth in its claims. The fact only minor players suffered the consequences while the death toll rises does tell us a lot everyone needs to know about today’s USA (and the fact its ex president won’t leave the country for fear of prosecution). It is therefore a bit annoying that this otherwise well made film chose to use cameras too quick on their axis to shoot with; then again, director Doug Liman does have Bourne lineage. Overall: An important story that should act as a role model for the rest of us. 3.5 out of 5 stars.